International faith leaders are in Honduras for a week-long pilgrimage. The interfaith delegation includes Jewish, Buddhist and Christian leaders from the Salvadoran Humanitarian Aid, Research and Education Foundation (SHARE), Interfaith Movement For Human Integrity (/im4humanintegrity/), representatives of the Leadership Conference of Women Religious (LCWR), Sisters of Mercy of the U.S. and South America, and a number of other Catholic sisters, including Grand Rapids Dominican Sister Joan Williams. 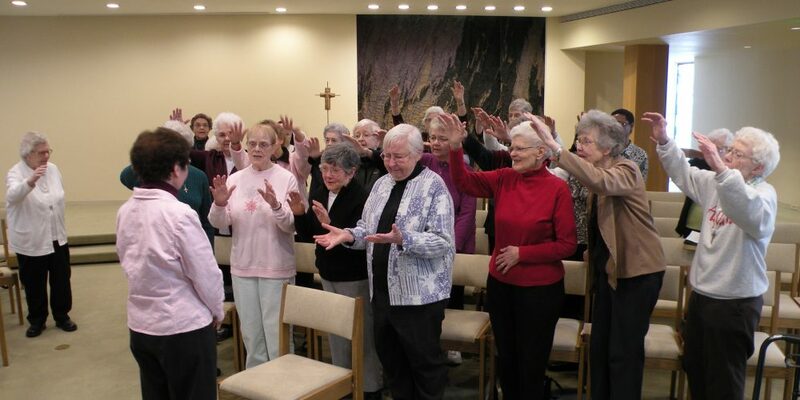 The Dominican Sisters~Grand Rapids blessed Sister Joan’s mission in Dominican Chapel/Marywood on March 11. “The migrant caravan from Central America is a modern day exodus. As people of faith, we cannot close the borders of our hearts to God’s people; rather we must walk with them, learn from them, and together address the root causes that force so many to take unimaginable risk for the sake of their families,” said Sister Ann Scholz, Associate Director for Social Mission of the Leadership Conference of Women Religious (LCWR). LCWR is an associate of leaders of congregations of Catholic Sisters in the United States representing nearly 39,000 women religious. “We envision a world where migration is not forced, nor criminalized, but rather understood as a choice for self determination and survival,” said Rev. Deborah Lee, Executive Director of Interfaith Movement for Human Integrity, one of the national leaders in the Sanctuary Movement of over 1000 Sanctuary congregations. “ It i s for us to come face to face with our own country’s complicity in the root causes driving forced migration, such as our U.S. foreign policy in Honduras, combined with environmental devastation by national and multinational corporations. “The date of the delegation visit will coincide with the 39 th anniversary of the martyrdom of Saint Oscar Romero, who was assassinated for his defense of the poor and speaking out on the repression by government forces in El Salvador on March 24, 1980. The delegation will commemorate the anniversary with a theological forum on how the teachings of the slain Archbishop of San Salvador are being applied in Honduras today.“ We go to Honduras carrying the spirit of Saint Oscar Romero and Berta Caceres on the anniversary of their martyrdoms. They both called for an end to the repression,” said Jose Artiga, Director of the SHARE Foundation which has a 40-year history of accompaniment and advocacy in El Salvador. “Saint Romero is with the people of Honduras today who are struggling for a dignified life and an environmentally sustainable future for their country. “It is a privilege to participate in a delegation that observes, listens and comes to a deeper understanding of root causes of immigration,” said Sister Kathleen Erickson, RSM, a member of the Sisters of Mercy of the U.S. , another co-sponsor of the delegation. “We go to gain more awareness of the connection between U.S. policies and their effects on the lives of people in impoverished countries. During the week, participants will also reflect on St. Romero’s message and its context in Honduras today.“All people are sacred across all borders. Compassion knows no borders and love has no walls. The Interfaith Root Causes Pilgrimage is symbolic of these values,” says Sister Joan Williams. “We walk in solidarity with our brothers and sisters wherever we encounter one another. During this week, we will walk with our Honduran brothers and sisters, across cultures, languages, and beliefs. We share one common identity of being human, made in the image of our Creator, with a need to be loved and love.”This focus on the people of Central America isn’t new to the Dominican Sisters~Grand Rapids.Sister Joan lived and served in San Pedro Sula for 19 years before returning to the United States two years ago this month. She provided theological pastoral formation, accompanied men and women in prison, and provided HIV education and support to multiple families who had children HIV+. She has witnessed the horrific violence, repression, and economic instability that force people to flee their homes and face the knowns of migration across borders around the world. Salvadoran Humanitarian Aid, Research and Education Foundation (SHARE) was founded in 1981 in Washington, DC. Their goal is to empower marginalized and impoverished Salvadoran communities in their efforts to both meet their immediate needs and to construct long-term, sustainable solutions to the problems of poverty, underdevelopment and social injustice. Initiatives vary from empowering young leaders in El Salvador to teaching women sustainable farming techniques to working with Salvadoran Hometown Associations to educating people in the United States about the effects of US foreign policy, SHARE work touches countless individuals, communities, and organizations. SHARE’s Major Delegations (El Salvador and Honduras) are a unique opportunity to walk with Salvadorans and people of other regions in Central America as they remember their past and face current struggles. Delegates learn first-hand about history, present challenges, and hopes for the future while building relationships with people, communities and organizations working for change. Miriam Noriega, Interfaith Movement for Human Integrity mnoriega @im4humanintegrity.org , (510) 948-7899. Joan Williams, OP was present for the March 3, 2016 funeral of BERTA CÁCERES. The human rights leader was murdered for advocating for the rights of the indigenous peoples and protecting the environment. According to SHARE, this criminalization of human rights defenders is consistent with a long history of violent repression by state and private businesses working together in the Bajo Aguán. Between 2010 and 2014, over 100 agrarian reform cooperative leaders and members were killed as they demanded return of stolen land, illegally held by palm oil corporations. A Dignity Camp hosted by members of the Guapinól community to protect against the contamination of their drinking supply was violently evicted twice, by hundreds of police and military officers. The Guapinól 12 have been wrongfully accused of initiating the violence – and now face “preventative detention” requiring them to remain in detention until the trial occurs, which can take up to two and a half years. Additionally they are being denied due process by being tried in a special “terrorism court” outside the regular legal system.